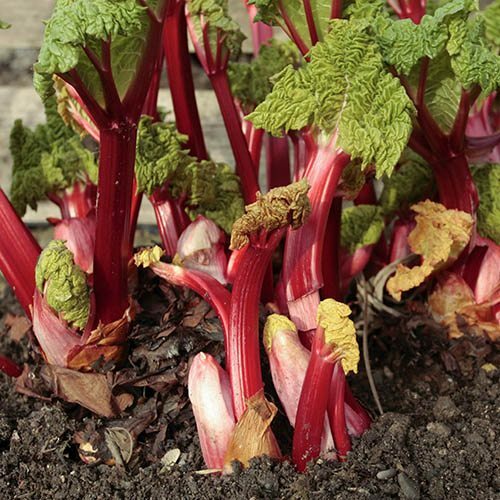 Everyone loves fresh Rhubarb in their garden, and it’s one of the easiest things to grow on a kitchen garden. But, it has one drawback – it throws masses of lovely succulent new stems in Spring for a Month, then that’s pretty much it…… feast and famine. That’s because all Rhubarb plants till now go dormant in Summer. Now, we are pleased to introduce a very special British bred variety called ’Livingstone’ – which is a day-neutral variety so eliminates this Summer dormancy – this means it produces stems in Spring, but then keeps on going into Summer with bigger crops again in Autumn – giving a bountiful supply for 6 Months or more. The flavour is good and sweet, and is a very easy to grow and long lasting plant – the crown wills lowly expand over many years producing more and more ‘stocks’ for you to harvest. One for the shopping list! Supplied as a small plant in 9cm pot, to plant in Spring for harvesting one year later.